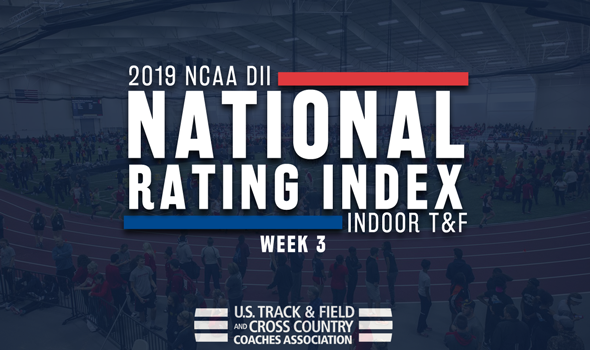 NEW ORLEANS – There was much movement to be had on both the men’s and women’s side in the latest edition of the NCAA Division II Indoor Track & Field National Rating Index released by the U.S. Cross Country and Track & Field Coaches Association (USTFCCCA) on Tuesday. The Adams State men regained the top spot in the country while the Grand Valley State women have held the No. 1 spot for three straight weeks. Much will continue to change as teams are diving into the heart of their schedules with the 2019 NCAA Division II Indoor Track & Field Championships just around the corner on March 9-10 in Pittsburg, Kansas. For the second time this season Adams State has regained its position as the No. 1 team in the country. The Grizzlies, who opened the season as the No. 1 team, climbed two spots this week to earn 183.02 points and retake the top spot in the nation. Adams State is coming off competition that split the team between the Colorado Invitational and the New Mexico Classic this past weekend. Top performances from the two meets came from Elias Gedyon and Austin Anaya who are now ranked as the No. 1 and No. 2 athletes in the mile in all of DII. Samuel Reid also posted the seventh-best mark so far in the weight throw (17.80m, 58-4¾). Dropping a single spot to No. 2 was Ashland with 168.35 points. The Eagles had athletes competing everywhere this weekend with performances at the Akron Invitational, the Hillsdale Wide-Track Classic and the Rod McCravy Memorial Track & Field Meet. To go with his other top times already posted this season, Myles Pringle had the best showing of the bunch as he ran the 14th-best mark in the country in the 200 (21.56) at the McCravy Memorial Meet. Also falling just a single spot was No. 3 Tiffin after it picked up 119.96 points. The Dragons finished first as a team at the Hillsdale Wide-Track Classic as they hit three provisional marks. The top performance of the weekend went to Toryko Grace who is now third in the country in the weight throw with a best chuck of 20.67m (67-9¾). Moving up two spots to No. 4 was Grand Valley State with 95.49 points for the highest rank achieved so far by the program this season. The Lakers were competing at the Meyo Invitational and the Hillsdale Wide-Track Classic and got top performances from Nick Salomon (sixth in the county in the 800) and Dennis Mbuta (eighth in the mile). Jumping up six spots to break into the top-5 for the first time in program history was No. 5 West Texas A&M after a strong showing at the Texas Tech Open. The program had standouts across the board in Lorenzo Johnson (tops the nation in the 60H), Quinton Sansing (fifth in the 200), Abraham Seaneke (sixth in the triple jump) and Brandon Rivera (eighth in the 800). The rest of the top-10 was rounded out by No. 6 Findlay (81.99 points), No. 7 Central Missouri (76.42), No. 8 Colorado Mines (75.54), No. 9 Academy of Art (72.10) and No. 10 Minnesota State (64.79). The largest jump in the ratings belong to No. 38 Cedarville after a 35-spot improvement. The biggest mover in the top-25 was Texas A&M-Kingsville who went from No. 41 up to No. 24. The No. 1 spot belonged with Grand Valley State for the third consecutive week after it received 201.75 points. The group was split between the Meyo Invitational and the Hillsdale Wide-Track Classic. Top performances from the weekend went to Rachael Walters (now third in the nation in the 800), Allie Ludge (third in the mile) and Ellianne Kimes (sixth in the pole vault). It is the first time a team has opened the year as the No. 1 squad for the first four ratings since Lincoln (Mo.) accomplished the feat to kick off the 2014 season. Just behind them at No. 2 is Adams State who is right on their heels with 200.94 points. The Grizzlies were also at two separate meets – the New Mexico Classic and the Colorado Invitational – and too saw standout performances across the board. Kadance Thomas and Roisin Flanagan each set new bests in the country in the 200 and mile, respectively. Other top performances came from Eilish Flanagan (third in the 3000), Tiffany Christensen (fourth in the mile), Kaylee Bogina (seventh in the 3000) and Malena Grover (eighth in the 3000). Advancing one spot up to No. 3 was SF State with 122.46 points after its athletes posted some of the best marks in the country in their events. Monisha Lewis now leads the nation in the 60 hurdles, while Alexis Henry is second overall in the 200 after weekend performances at the New Mexico Classic. The program’s 4×400 team also set the best time in the country with a 3:40.16 converted time at the same meet. Falling a spot to No. 4 was Lincoln (Mo.) after it picked up 104.65 points. The Blue Tigers spent the past weekend at the St. Louis Collegiate Indoor Classic and were led by Rene Medley who posted the third-best time this season in the 60. Jumping up one spot was No. 5 Lewis with 88.39 points after it had athletes at the Meyo Invitational and the ONU Invite. Its top performance came from Ashleigh MacLeod who is now sixth in the nation in the 800. The top-10 was completed by No. 6 UC-Colorado Springs (81.02 points), No. 7 Simon Fraser (73.28), No. 8 Alaska Anchorage (67.63), No 9 Ashland (62.40) and No. 10 Azusa Pacific (60.73). The largest improvement this week belonged to No. 25 Shippensburg who saw an almost unheard of 71-spot rise from the previous edition after a strong weekend at Penn State’s Sykes & Sabock Challenge Cup. It is the first time the program has been in the top-25 since 2017.